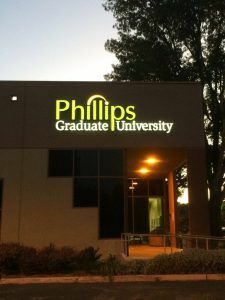 After over 40 years of graduate education and training, Phillips Graduate Institute became Phillips Graduate University. Just like a logo or company name change for a business, the branding and signage is crucial to make the public aware of your changes. Phillips came to us to completely update their indoor and outdoor signage to reflect the new changes and we were more than happy to help. One of the signs they needed to update was their exterior building signage. Along with changing “Institute” to “University”, the font was changed slightly and for the front-lit channel letters, the shade of green was changed slightly. These are subtle changes along with the name change that can give the facade and school a new look. One channel letter sign was to be installed in front of the building and the other on the side so they were made identical. Phillips wanted front-lit channel letters so we started with an aluminum backer and aluminum returns. We installed white LEDs inside of each channel letter and painted the returns black on the outside. We also used black trimcaps to match the returns and to create a slight border around each letter. As you can see from the photo, the channel letters are much thicker than the letters they had previously so they create a great 3-dimensional look. For the faces of the channel letters, we used translucent vinyl since the building sign will be illuminated at night time. 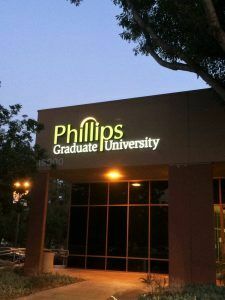 For “Phillips” and the yellow logo with the dot, we digitally printed the school colors onto the vinyl and laid it on white sign acrylic. 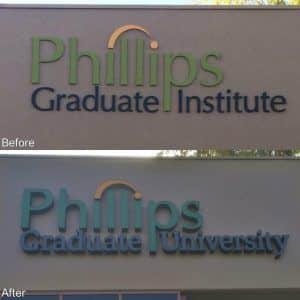 For the words “Graduate University”, we used black day and night vinyl. Day and night vinyl is perforated so in the daytime, you see the color of the vinyl, however when it is illuminated you no longer see the black and the letters appear white because of the white acrylic and white LEDs. This is a great option if you are an establishment that is open after sunset. The black words contrast well against the light color of the building wall in the daytime, but at night time the letters illuminate white so the building sign is visible and legible all through the day. After pulling the existing sign off, we needed to patch and paint the area due to the damage caused by the removal. After the paint was dry, we came back to install the new channel letter sign we made. Check out our website to see many galleries of the different channel letters we make. If you are interested in getting a front-lit channel letter sign for your business, you can request a quote here.